Gametize is the world’s simplest enterprise-grade gamification platform for community engagement and advocacy. Clients use Gametize to motivate target behaviours for various purposes, such as in employees training/performance management, or consumer marketing/sales advocacy. The highly customizable and versatile solution is available on both cloud and on-premises. 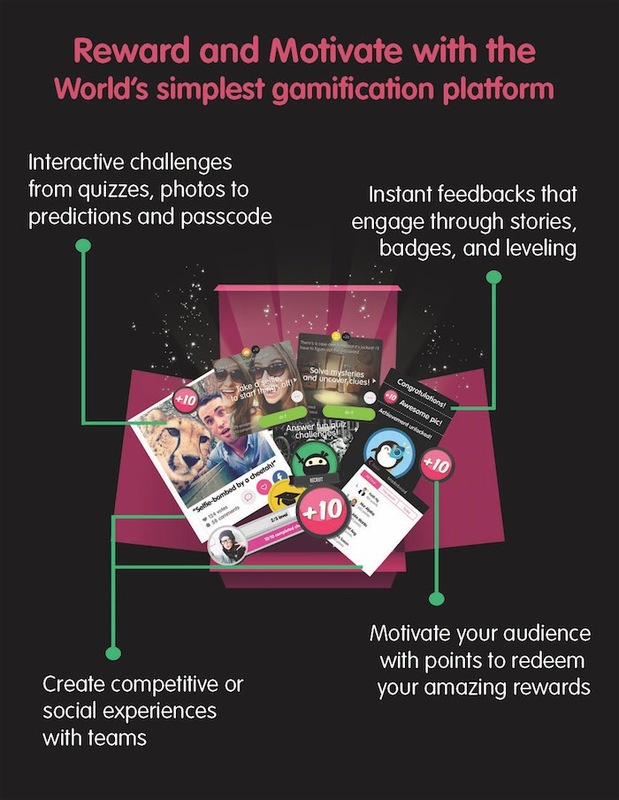 Anyone can create a white-label web/mobile campaign in just 5 minutes, leveraging Gametize’s key gamification mechanics (interactive challenges, automated feedbacks, competition and socializing, and rewards redemption), coupled with their own narratives and theme. Users can complete these fun, social challenges such as answering a trivia, post a photo, and later receive feedbacks such as points, badges, before redeeming prizes such as “lunch with a celebrity” in the rewards store. Gametize is trusted by brands such as Shell, Samsung, P&G, DBS, Singtel, and Accenture, with 15 million challenge completions and more than 300,000 registered users. Gametize has been endorsed by academics and research companies in reports or case studies, such as Bond University, San Jose State University, Forrester. Gametize was also selected as Singapore’s 20 hottest startups in 2015 by Singapore Business Review magazine, and IBM SmartCamp (ASEAN) People’s Choice Winner in 2013. Q: Can you prepare a proposal for us? A: We practise a zero pitching policy, so we could focus on our existing clients. Though, depending on our bandwidth, we might be able to sneak in a mockup game for you during our coffee breaks. Do speak to your client engagement rep. to find out more. Q: Could you share more about your security and privacy policies? Q: How much white-labeling/branding is possible on your native apps? A: Our templates have certain layouts which enable a fast turnaround development time, while allowing certain branding options. Just ask for our Customizable Branding Guide or go to http://corp.gametize.com/whitelabel. Q: We really like your UX. Can you custom build an “Uber for Marshmallows” app? A: Thank you, we love them too (and marshmallows as well). However, Gametize is not a dev house and our focus is on improving our enterprise-grade product constantly.